Despite the plethora of neon signs illuminating bars, restaurants, and man caves throughout the city, neon sign making is something of a lost art. “The industry has shrunk in the past 20 to 30 years due to LEDs being used to light signs internally. That used to be done with neon tubing,” says Tom Wartman. 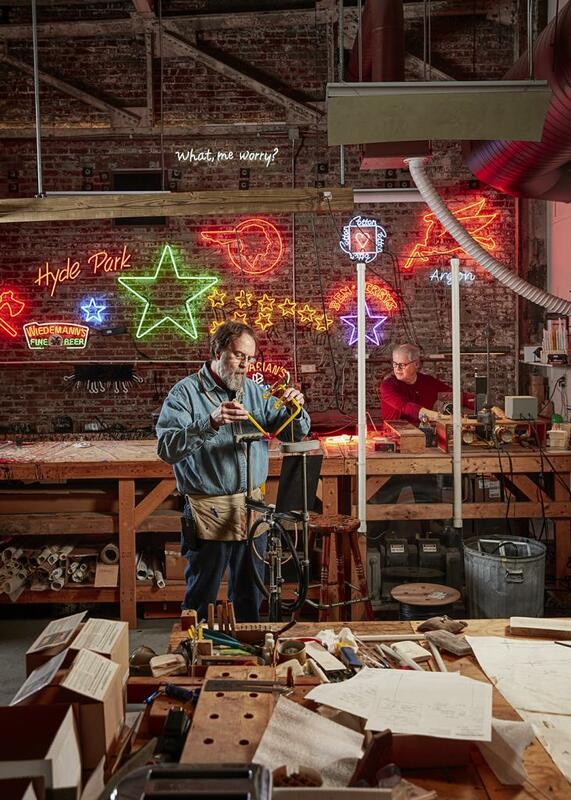 He and his colleague Greg Pond are neon tube benders, and the brains behind Neonworks, the tri-state’s only full-time neon sign shop. Since 1991, they’ve repaired, restored, and created custom neon signs for commercial and residential clients. The duo’s work shines throughout the Queen City, including at the 20th Century Theatre in Oakley, Paul Brown Stadium downtown, and the American Sign Museum in Camp Washington. In 2010, Neonworks moved from Evendale to its current workshop attached to the Sign Museum, where Wartman and Pond shape and fill glass tubes with neon and argon gas. “People want to call us artists a lot. We kind of reject that, because we don’t make art,” Wartman says. “We craft signs.” Art or not, their vibrant creations sure are fun to admire.